Kitesurf lesson in Zandvoort. With years of experience, we now have 2 good located VDWS and IKO kitesurf schools. We are located on the beach by Safari lodge and by Tijn Akersloot. In all our lessons is material always included and our radiocommunication. With our radiocommunication, you learn faster independently kitesurfing. 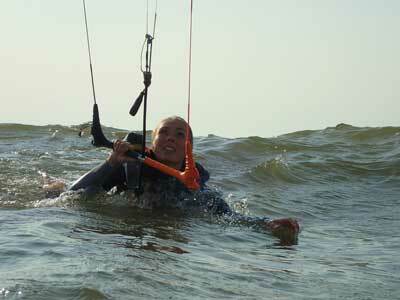 Book now your Kitesurf lesson in Zandvoort. ALREADY HAD LESSONS, CHECK HERE! and enjoy a nice day out! Learn the basic of kitesurfing. 3 days and you can surf few meters. Do you want to get a real kitesurfer. Learn jumping, or surf the waves of the North Sea on your board. Direct Coaching: Through our lessons we use radio communication. The importance of understanding the instructions through the surf lessons is number 1. Through the portable radio, your instructor will always be able to reach contact with you. More freedom: There is no better feeling than freedom on the water either with body dragging or actual kitesurfing, but it can happen that you need some instruction/help from your instructor, and therefore we have the portable radios. Safety and freedom at the same time. I want to kitesurf, but where, what and when? Kitesurfing is a weather-dependent sport, that means that it is depending on the wind. Our kitesurf school have more locations, which makes it possible to almost always have a good spot to go kitesurfing. The decision of where to go, we always discuss with the student beforehand. Each location is different and we decide from the direction of the wind, how strong the wind is and the quality of the wind, to make sure that each student will get the best experience on the water. To book your kitesurf lesson, please click on the button “BOOK NOW”. that will lead you to our online booking system, where you can sign up. In our booking system, you can schedule your lessons completely te your own schedule. If anything isn’t clear, you can always contact us and we will help you out. WILL THE COURSE ALWAYS GO THROUGH? Kitesurfing is a weather dependent sport, and we, therefore, can’t guarantee that the weather and wind always allow it to go through. We use our experience and several different weather apps to conclude if the lesson can go through or not. The day before your lesson we will send you an email and a text, stating a yes or a no to the weather. If the wind is too less or too hard, we will have to reschedule the lesson. To reschedule the lesson, you can log in to our booking system and choose a new date. Our kitesurf material is of good quality and the kind of material we use ourselves when on the water. We have the newest material, thick wetsuits to never get cold, shoes, gloves and hats if you need that too. We are using Harlem kitesurfing and mystic kiteboarding material. In all lessons, the material is included except when stated otherwise. We provide most of the material for your lessons, but important is that you bring your swimsuit and a towel. It is prohibited to use our wetsuits without swimsuit underneath. From experience, a tight pair of shorts is the best for men, and a swimsuit or comfortable sitting bikini. It’s always a good idea to bring something to drink and eat. On most of our locations, there will be the possibility to buy food and drinks too. Straight on the beach in Zandvoort South. With east wind, Medemblik is the perfect flatwater location. Medemblik is around 50 min drive from Amsterdam. 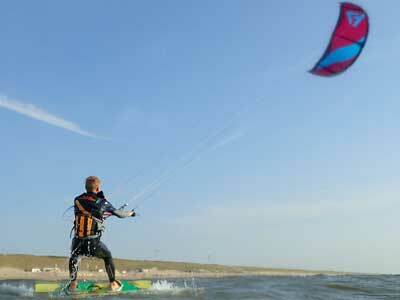 For more information about kitesurfing in Medemblik. Hiphigh flat water and north winds! Muiderberg is 30 min drive from Amsterdam. 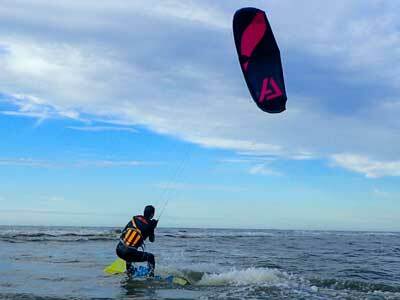 More information about kitesurfing in Muiderberg. Every day closed from 22:00.